It’s at an embryonic stage but guitar builder Rick Toone is working on Headless Monster – a 5 string bass guitar worth keeping an eye on. Based on the Orchid bass guitar, it’s a headless bass guitar with a prototyped bridge and tuning system based on levers rather than screws. The trapezoidal neck profile is back but as an asymmetrical version (see the second photo). 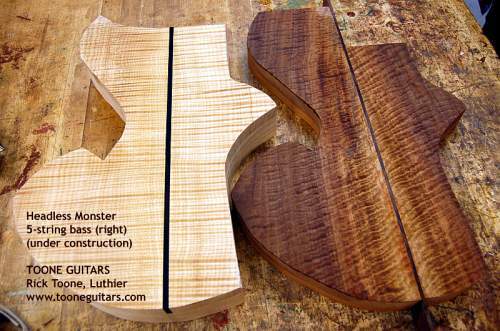 Pickups are still under evaluation and according to Rick, Headless Monster will include a “Monster (very scary) inlay at the octave”. The instrument is being built for the bass player known simply as “Monster” who you can see demoing the Orchid bass guitar in Monster Meets the Orchid Bass. I. PICKUPS â€” I spoke to the kind folks at Lace pickups and the sent me a prototype P-Bass Alumitone to test. They are very excited by Alumitone technology, and the tonal possibilities it holds, moving forward. One of the issues I faced with Orchid is the platform â€” the instrument itself â€” is far more resonant, with a very wide frequency spectrum, than the EMG-MMTW is capable of reproducing. If you think of Orchid as capable of reproducing the entire color spectrum from indigo to bright red, the pickup is only capturing the greens and yellows in the center. The EMG’s are wonderful pickups â€” I love them â€” but they excel in a more traditional bass presentation. Not every bassist is going to want to produce the full frequency spectrum â€” depends of course on your style of music and appropriateness â€” but for those who do, I’ve realized I need a different type of pickup. The Alumitone holds possibilities. May try them with a 1 Meg-ohm pot. And I may seek an acoustic pickup to blend and augment the attack and responsiveness. Something like a Lindy Fralin would work equally well for a more “traditional” tone…the pickup would just ignore some of the highs and lows, focusing on the lower midrange. I’ll report on the Alumitones as we experiment. II. LEVER TUNING SYSTEM â€” I’ve been short on time recently, and need to take a few hours to finalize drawings for the machinist. I love the crude protoype, and â€” call me simpleminded â€” take delight in just moving the lever and playing with pitch. It’s really different from other tuning mechanisms. Lately I’ve fallen in love with titanium (feather weight + gorgeous tone) so if any clients have an extra grand to drop on raw materials, it would be nifty to go totally Ti instead of stainless steel. Any volunteers in the studio audience? Thanks for the update Rick! It’s very interesting to have a neck like this one. I ask myself, when you design such thing, you actually take into consideration usability and after this design your piece or you just think how would it go and you build it to see how it goes?! 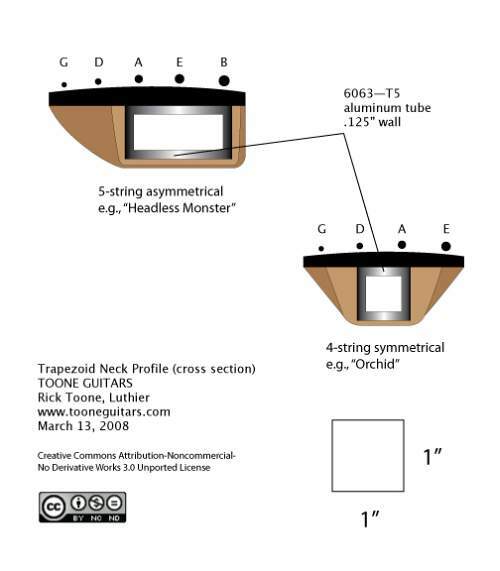 Take a look at The Orchid Bass Sprouts An Unusual Neck for more on the design and Rick’s more detailed explanation – Trapezoidal Neck Profile. Robert â€” ever the gracious host â€” pointed (linked?) you in a good direction to understand more of the thoughts behind the trapezoid neck profile design specifics. On a more philosophical level, you also seem to be wondering: “Does form follow function?” Essentially, how do I think about design? Which do I consider first? And why? I would like to credit a wonderful book by architect and writer Paul Jacques Grillo entitled “Form, Function & Design” which is just a masterpiece of clear thinking about the relationship between form and function. Amazon: Form, Function & Design . Grillo’s book informs every design choice I make. Thanks for the recommendation, Rick. Sounds like I have another book to add to my library. That’s great stuff Rick! I love the fact that you are thinking of alternate mechanical tuning schemes. The neck design is wonderful too, I would love to be able to feel the shape. Your wood choices and contour shapes are also very inviting. Al, thanks for your kind words. If you’re near New Jersey and want to play it when finished, please don’t hesitate to contact me. In fact, I’ll extend this invitation to all BTEG readers â€” I’m about an hour west (or south) of NYC â€” visit and play any instrument, as completed. Dove is going to be an interesting experiment, for you 6-string slingers. Rick, I’m in the DC suburbs, so I would be able to make it up to check out your work on a weekend. Thanks for the generous offer to all of us here on BTEG! Great, Al. You’d be welcome. As Dove nears completion I’ll reiterate the offer. I feel very comfortable extending the invitation to the readers of BTEG. I’ve found the folks here to be very well informed, passionate, yet polite and respectful. Due, in part, to Robert’s adept hosting skills. By following his own bliss, he’s allowed us a “place” to meet in the wilderness of poor design and blind traditionalism. Point is, by meeting in the guitar shop, cranking up a tube amp (or Monster’s Trace Eliot sarcophagus…with advance notice we could probably expect Monster, himself) we can blow around the wood shavings and learn from one another. Bring your favorite instrument or amp and let’s A/B until our ears ring. I wouldn’t be shocked if some good new ideas emerge. And good ideas will benefit us all. Clearly a mid/late-summer critique session is called for. Looks as if Al and Roger are in, so far. Monster, and me, of course. Robert? Anyone else…Bueller? Summer. Reminds me of something. Ah! Hot BBQ. Cold beer (wine). Custom instruments. An array of amps. Rural setting. Combustible combination. Hoo â€” I’d better get BUSY! And thanks so much for extending the invite to BTEG readers! I would definitely be into a get-together. I am new to this blog but love the ideas and support flowing through it. Count me in! P.S. Rick and I discussed the next evil guitar/bass idea yesterday. He is infinitely more articulate than I so I will leave the details to him. Hopefully see you soon!